Second-grade students in Carol Clark's class dance during El Grito del Valle at Dillon Valley Elementary. The celebration of Mexican Independence also included a 1.5 or 5K run for parents, teachers and students. Bright hues of orange and red mixed with green Sunday, but it wasn’t from changing leaves on the first day of fall. Rather, the colorful, swaying skirts at Dillon Valley Elementary marked the celebration of Mexican Independence Day. The community celebrated El Grito del Valle, honoring Mexican and other Latin American independence. The event began at 11 a.m. with a 1.5 and 5K run/walk through the Dillon Valley neighborhood. Teachers and parents lined the corners, cheering on families with cries of “rápido!” and “muy bien!” Spectators blew loud plastic horns and some neighbors even squirted water guns over the heads of the runners on the already-rainy day. All of the funds raised from the registration, as well as all of the food sales, went to the dual language program at the school. Second-grade teacher Isabel Rodriguez said more than 50 percent of the students at the school are Spanish-speaking. “This one event brings the whole community together — teachers, parents, students,” she said. Dillon Valley implemented a dual language program in 2005, which fully develops both English and Spanish languages for all students. Rodriguez likened El Grito del Valle to a Mexican kermesse, a festival where people sell donated food to gather funds, much like a traditional bake sale. All of the food at Sunday’s event was cooked and donated by Hispanic parents in the community. Tamales and brown rice were dished out on plastic cafeteria trays next to enchiladas and bowls of chili. The song “Summer Nights” from the movie “Grease” blasted over the speakers in Spanish. Painted signs spoke to the duality of the elementary school, with printed menus and instructions in both English and Spanish. In Spanish, “El Grito” means “the scream” and references how on Sept. 16, 1810, Father Miguel Hidalgo cried out to his people to rise up and rebel against Spain, which ultimately led to Mexico’s independence. 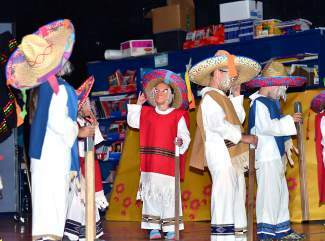 A group of second-graders wore masks and sombreros as they circled around the stage, while another class danced holding hand-painted Mexican flags. Some girls wore traditional Mexican dresses, while most students sported their shirts from the earlier run. Kindergarten teacher Emily Galvin said the event, now in its eighth year, usually raises thousands of dollars for the language program. She estimated there were around 500 participants total on Sunday. She said it’s difficult to find textbooks printed in Spanish, and the money they raise at El Grito del Valle helps provide those valuable resources. Julie McCluskie, Summit School District communications coordinator, said the event has gotten bigger and bigger over the years and is always lots of fun.